For most cross stitch projects you will use DMC Mouline Stranded Thread. DMC Mouline Stranded Thread is the highest quality and most widely used thread in the world. It is made from long staple 100% Egyptian cotton and mercerised to give a beautiful sheen. 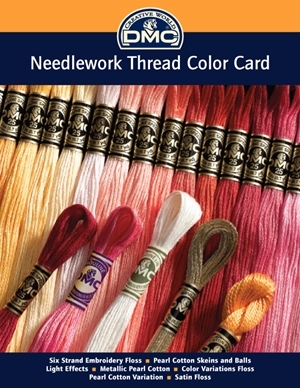 There are over 450 colours of DMC Mouline Stranded Thread. Other DMC threads to use when cross stitching include: DMC Color Variations Thread, DMC Light Effects Thread and DMC Satin Thread. All of these threads are also composed of six individual strands that can be easily separated. All DMC Threads are made from the world’s highest quality fibres and are either mercerised or finely twisted so that the beautiful lustre and brilliant dyes are consistent skein to skein, ensuring that your project will withstand the test of time. DMC Threads are all 100% colourfast and fade resistant. Select an evenweave fabric for cross stitch projects. For beginners it is best to start with 100% cotton Aida fabric. Its precise square-patterned weave with visible stitching holes, or squares, makes this fabric easy to use and allows the needle to glide easily through the holes. When a project calls for Aida fabric, it usually lists a count. The count indicates how many squares per inch of fabric. Each square or hole represents a cross stitch. DMC & Charles Craft Aida are available in a variety of different counts ranging from 11, 14, 16 and 18, with the holes being larger or smaller. The smaller the fabric count the larger the holes in the fabric. For example 11-count Aida fabric will have 11 holes per inch. This is why for beginner projects it is recommended to use 11– count or 14 - count Aida fabric as the holes are larger making it easier to stitch and to count. DMC and Charles Craft Aida fabrics have a wonderful finish and are available in a variety of colours and types. People often learn how to do counted cross stitch on Aida and later learn to stitch on linen or other evenweave fabrics as they become more experienced. The term evenweave refers to the fabric having an even number of weft and warp threads per inch. Warp threads run the entire length of the fabric, while the weft threads run side-to-side, from selvage to selvage. 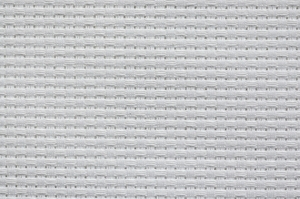 The thread count for evenweave fabrics is determined by this number – for example, 22-count linen has 22 vertical warp threads and 22 horizontal weft threads per inch of fabric. The higher the count number, the finer and closer the weave will be. Aida is worked with one X over one square, linen and other evenweaves are generally worked over two threads. 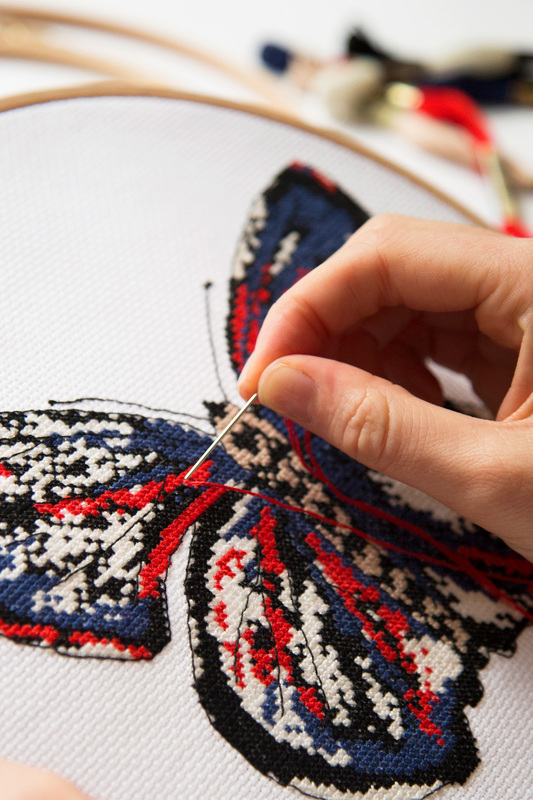 The common term for this technique is simply called “over two threads.” Stitching “over two threads” on 28 count linen produces the same size design as one stitched on 14-ct Aida. - Fractional stitches (quarter stitches and three quarter stitches) can be hard to make on Aida fabric as the needle goes through the middle of the square. Stitchers sometimes prefer to use another evenweave fabric such as linen as the needle simply goes between the two threads. - Most evenweaves have a soft feel and aren't as stiff as Aida. This can be a plus or a minus, depending on your preferences. The difference in stiffness isn't usually a factor if the fabric is worked in a hoop or on scroll bars. Stiffer fabrics like Aida can be worked without a hoop and still not get distorted while stitching. - The look of the cloth for the background of the design is also important when selecting a fabric. Both texture and colour should be considered. There are a number of other fabrics and items you can use for your cross stitch such as Vinyl Aida, Waste Canvas, Soluble Canvas and ready-made Afghans. For cross stitch projects use DMC Cross stitch needles. Cross stitch needles have an elongated eye for easy threading and a blunt tip that glides smoothly through the holes in your fabric. The number of the cross stitch needle corresponds to the size of the eye and the thickness of the needle. The higher the number of the needle, the smaller the eye and thinner the needle is. 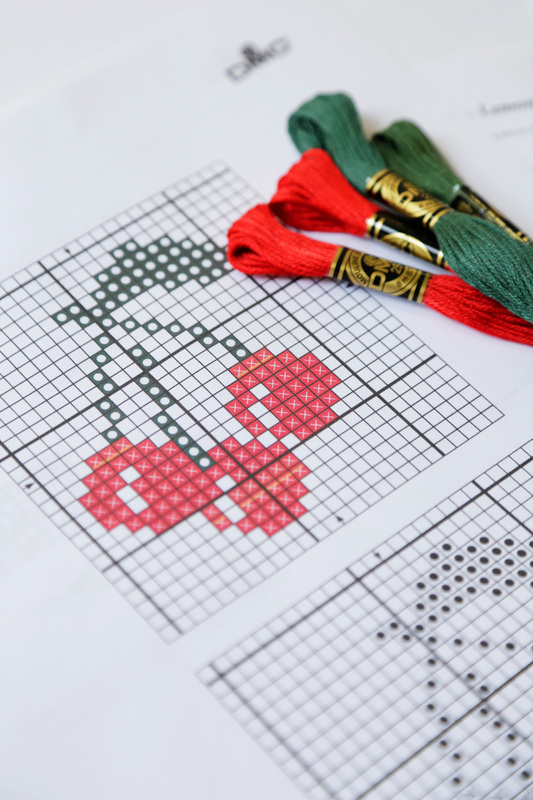 Your Design Chart contains all the information you need to stitch your design. The chart lists what kinds of thread to use, how many strands and the fabric type and colour. The squares on the Design Chart correspond to the squares on the fabric, every square on the design chart that requires a stitch will contain a symbol. 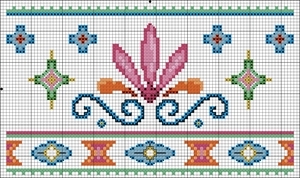 Cross Stitch design charts are plentiful, varied, and easy to find. A good place to start is this website under Inspiration (Link) where you can find a variety of different projects that are categorised by the threads used and the skill level required. Also check your local needlework or craft store, which will have leaflets, books, and numerous stitchery and craft magazines offering you an array of newly published designs. Keeping your fabric taut while stitching is the best way to keep your stitches even and the tension of your stitches consistent. Choosing the right product depends on the size of your project and personal preference. The most versatile and inexpensive is an embroidery hoop while the more experienced stitcher may prefer the versatility of a scroll bar frame for larger projects and stretcher bars for smaller projects. 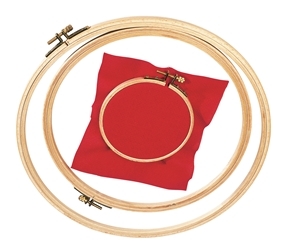 Round Embroidery Hoops are the most common shape available and they generally range in size from 3” to 12”. They’re made from either plastic or wood and come in various styles and screw locking systems. Select a hoop that is slightly larger than the design area. The fabric should extend about 2” beyond the edges of the hoop to allow you to position and secure the fabric properly. To learn how to use an embroidery hoop click here. For information on scroll bar frames and stretcher bars click here. The DMC Colour Card is a wonderful reference tool to have on hand when searching for a special colour. It allows you to view the entire colour range and compare the subtle shades of each colour available in the DMC thread range With the DMC colour card you can choose your own colour palettes to personalise any cross stitch design or find a substitute shade should your shop be out of a colour. Some people like to mark a grid on their fabric so it’s easier to follow the design chart. Use a Water Soluble Marker to draw grid lines on your fabric according to your design chart so you can easily count out stitches. To draw grid lines on your fabric draw vertical and horizontal lines every 10 stitches. Most charts have bolder grid lines every 10 stitches for this reason. It’s also helpful to put a tiny dot in the centre of your fabric to help you centre your design. (See below on how to find the centre of your fabric) When you’re done stitching, the marker washes cleanly away. Use DMC’s Magic Guide Fabric when stitching a larger project. The grid lines on the fabric correspond to the stitching chart with a line every 10 blacks of Aida. The grid lines disappear completely when washed. TIP: To help keep your place on a chart, try using a “Post It” sticky note under the line you’re about to stitch. By exposing one line at a time, it will be easier for you to follow the chart. When you finish stitching the line just move the note onto the next line. Your eyes and needlework project deserve optimal lighting while stitching. Choose a bright light directed onto the surface of the design. Floor lamps and swivel armed clamp style lights work well and are adjustable. 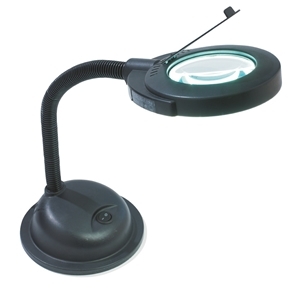 For the advanced stitcher, several manufactures produce lamps with attachable magnifiers. Thread Heaven – When stitching with specialty fibres DMC recommends using Thread Heaven, a thread conditioner available at most needlework and craft stores. The conditioner coats your thread to help hold the strands together and can be beneficial in aiding the thread to glide smoothly through the fabric.